These two bookcases are movies. DVDs on the left, Blu-Rays on the right. 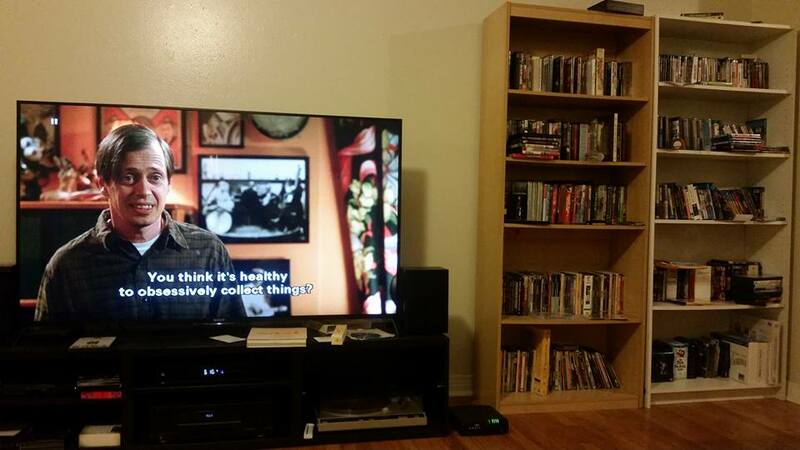 I have a smaller bookcase to the left of the TV with TV show DVDs and Blu-Rays. For years I used bankers boxes, but have started moving discs over to storage cases with the discs in plastic sleeves. I'm concerned about long term storage having the discs' surface in contact with the sleeves, but am tired of the boxes. A more modern solution would be to rip them, put them on a NAS (network attached storage) designed for media storage, such as the Synology Play series, and (ahem) "recycle" the DVDs on eBay, but I'm not there yet.